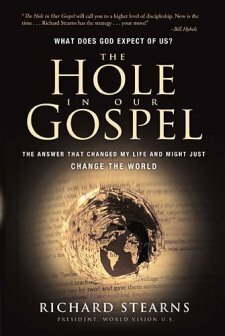 I have been reading the book The Hole in Our Gospel by Richard Stearns. As the President of World Vision, Richard has a heart for reaching out to the poorest of the poor, to put our Christian faith into action. This book is about how God used him, took him out of his comfort zone living the 'American Dream' as the CEO of Lennox, and sent him to places he could never have imagined. I found his personal story very fascinating. He is very honest about his 'calling' by God, how he felt and reacted. He became very real and honest which I believe is refreshing. Not everyone answers God's call on their life with astounding joy. He does a great job in telling the events that led to his decision to join World Vision. I did have a hard time reading parts of this book for a couple of reasons. First of all, I have to say I had an uneasy feeling about several areas. I do believe our faith should be evident in our deeds, our works. We should care for the poor as Christ commanded us, there is no doubt. But I had the sense that he, at times, was considering what we do for others' physical needs here on Earth more important than our seeking to save them for eternity. I'm not sure if that is what was meant to be implied... that is just how I felt. I believe they should go hand in hand. Jesus preached and met needs. I don't believe we can have one without the other. It was also hard to read the horrible truth of the poverty stricken countries. He brings the people he has met close to home and makes them real for us. It is a picture of what we need to see. Regardless of where we are in life, there is always someone, somewhere that we could be helping. While I struggled with reading, falling into agreement/disagreement with the author, the one point I can not dismiss is that we should all do our part. Jesus commanded us to go into all the world and preach the gospel. And he told us to love others as we love ourselves. If we love God, we will obey His Word. I thought this book was well worth reading and would recommend it if you would like to know how you can be more involved in meeting the needs of others.